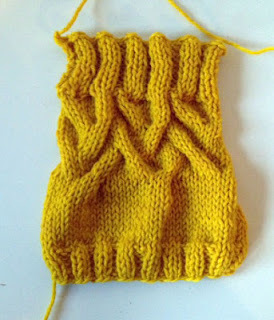 I didn’t like the cable pattern after all so I changed my idea for the cable pattern and did a swatch. I calculated two sizes and I am knitting the smaller one because I am not sure I dyed enough yarn. I will have to have my niece model it again I think. It is a quick knit with the bulky yarn so I will be done in no time.